Surgical scar revision is an option available to patients faced with scars originating from injury or through surgery. Depending on the severity of the scar, revision of the scarred tissue may aid in the restoration of both form and function. Scar tissue forms as skin heals after an injury (such as an accident) or surgery. Depending on the extent of the surgery, scar revision can be done while you are awake (local anesthesia), sleeping (sedated), or deep asleep and pain-free (general anesthesia). When to have scar revision done is not always clear. Scars shrink and become less noticeable as they age. You may be able to wait to have surgery until the scar lightens in color. This can be several months or even a year after the wound has healed. For some scars, it is best to have revision surgery 60 to 90 days after the scar matures. Each scar is different. The scar may be removed completely and the new wound closed very carefully. Dermabrasion involves removing the upper layers of the skin with a special wire brush called a burr or fraise. New skin grows over this area. Dermabrasion can be used to soften the surface of the skin or reduce irregularities. A laser may be used to soften the surface of the scar, and stimulate new collagen growth within the scar. 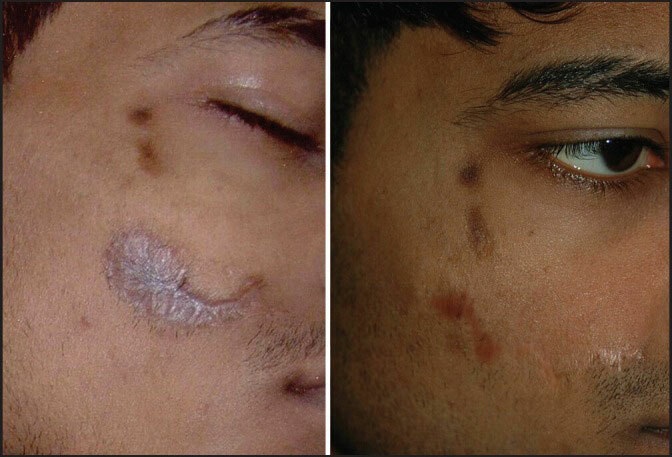 Very large injuries (such as burns) can cause loss of a large area of skin and may form hypertrophic scars. These types of scars can restrict movement of muscles, joints and tendons (contracture). Surgery removes extra scar tissue. It may involve a series of small cuts (incisions) on both sides of the scar site, which create V-shaped skin flaps (Z-plasty). The result is a thin, less noticeable scar, because a Z-plasty may re-orient the scar so that it more closely follows the natural skin folds and releases tightness in the scar. Skin grafting involves taking a thin layer of skin from another part of the body and placing it over the injured area. Skin flap surgery involves moving an entire, full thickness of skin, fat, nerves, blood vessels, and muscle from a healthy part of the body to the injured site. These techniques are used when a large amount of skin has been lost in the original injury, when a thin scar will not heal, and when the main concern is improved function rather than improved appearance. Tissue expansion is used for breast reconstruction. It is also used for skin that has been damaged due to birth defects and injuries. A silicone balloon is inserted beneath the skin and gradually filled with salt water. This stretches the skin, which grows over time.